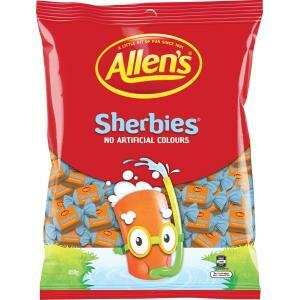 Create a smile with Allen's Sherbies, the deliciously tangy orange flavoured chews with a fizzy sherbert centre. Bite one and feel the sherbet fizz tingle on your tongue. Available in bulk for your next meeting, function or conference. Cane Sugar, Glucose Syrup (From Corn), Vegetable Oil, Food Acid (Tartaric), Mineral Salt (Sodium Bicarbonate), Flavour, Colours (Paprika Oleoresin, Carminic Acid), Vegetable derived Emulsifier (Monoglyceride, Soy Lecithin).